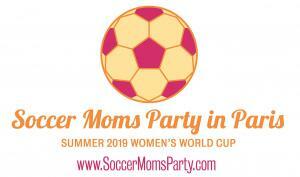 Recruiting for Good sponsors purposeful service helping Soccer Moms Party in Paris by funding and saving money on flights, hotels, tours, and World Cup tickets. 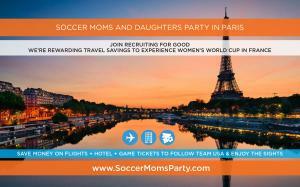 SANTA MONICA, CA, UNITED STATES, September 12, 2018 /EINPresswire.com/ — www.RecruitingforGood.com is rewarding soccer moms referrals to companies that retain the staffing agency for search with travel savings to enjoy World Cup mother daughter Paris trips. 1. Daughter must be playing soccer in a school team or league. 2. Email [email protected] to meet and talk about moms' purposeful travel funding service. 3. Mom makes a referral to a company hiring “white collar” professionals in Accounting/finance, engineering/IT, HR, Marketing, operations, or sales to Recruiting for Good. When Recruiting for Good finds the company an awesome new employee and earns a finder's fee; soccer mom (who made referral) will be rewarded Special Women's World Cup Mother Daughter Trip. Excel Soccer Tours designed and organized a special Mom Daughter 9 Day Paris Trip which includes; flights, hotel, soccer friendlies, city tours, and tickets to World Cup games (for 10 moms and 10 daughters who play soccer). After mom successfully participates in Recruiting for Good, soccer mom pays $500 toward Mom Daughter trip; and Recruiting for Good pays the rest balance. WorldStrides Excel Programs provides 15+ years of experience arranging international soccer tours for youth, academy/club, ODP and university teams means we know how to put the best tours together for your chosen destination.